Greetings from The 88 Project! 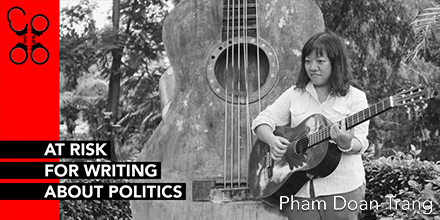 We are bringing you news, analysis, and actions regarding human rights and civil society in Vietnam during the week of April 8-14. Authorities have arrested another driver, Tran Dinh Sang, who has been active in protesting traffic issues, such as Build-Operate-Transfer tolls. Twelve of the 15 Bien Hoa City protesters imprisoned for protesting bills on Special Economic Zones and Cybersecurity in June 2018 have been released from prison after completing their prison sentences. This week, we remember the April 2018 ten — ten human rights and democracy activists sentenced to a combined 96 years in prison last April. Lawyer Vo An Don, who worked on Me Nam’s case, has been disbarred after a long legal battle. And a young student has refused to read a statement justifying the forced evictions in Loc Hung that affected him and many other families earlier this year. In international advocacy, read the latest report on the death penalty from Amnesty International, which puts Vietnam in the top five worst executioners during 2017-2018. And in the news, read about abuse against women in the garment sector in Vietnam and new cyberlaws across Asia. Coming up, we’ll be releasing our first episode of our interview series with female activists! Please take action for political prisoner Huynh Truong Ca, who is suffering from many health issues while in prison. Please subscribe to the newsletter! In the morning of April 9, 2019, the Public Security of Yen Bai city, Yen Bai Province arrested Tran Dinh Sang under the charge of “resisting officers in performance of their official duties” (Article 330 of the 2015 Criminal Code) when he was at home. Tran Dinh Sang, a driver, usually protests against traffic issues, such as the Build-Operate-Transfer tolls. His Facebook account, where he updates his activities, has attracted more than 100,000 followers. It seems like security forces have recently targeted drivers such as Ha Van Nam and Tran Dinh Sang, who have had a strong influence on netizens and have been active in anti-corruption activism. Tran Nguyen Duy Quang and Pham Ngoc Hanh remain imprisoned. Lawyer Vo An Don, who has represented political prisoners and victims of injustice, has officially and permanently been disbarred after an appeal of the previous decision to disbar him was upheld. Read more about his history as a the “farmer lawyer” and his long legal battle for his right to practice law, here. A young student said he would not read a prepared propaganda statement justifying the forced evictionsat Loc Hung gardens in January. His teacher had requested he read the document in front of other students, but the boy, who lost his home in the land confiscation, refused. After the evictions on January 4 and 8, hundreds of residents, many of them political activists and veterans of the former Republic of Vietnam, suddenly found themselves homeless, with neither compensation for the lost land nor the benefit of a resettlement program. The land has been under an ownership and price dispute between the local government and the households there for nearly twenty years. Read more about the incident and its legal implications, here. Even though global executions under the death penalty decreased significantly from 2017 to 2018, Vietnam was ranked in Amnesty International’s recent report as one of the world’s worst executioners, with 85 people executed in 2018. The report notes that “78% of all known executions were carried out in just four countries – Iran, Saudi Arabia, Viet Nam and Iraq.” Information on the death penalty use in Vietnam is normally very difficult to obtain, and the death penalty is still used there in cases of economic and drug-related offenses, which is in violation of international law. More than 600 people are currently sentenced to death in Vietnam (as of the end of 2018). Read the full report, Death Sentences and Executions 2018, here. Is being an activist more difficult if you are a woman? We’ll try to answer this question in our upcoming interview series with Vietnamese female activists. First episode coming soon! Click here for a preview. Please take Amnesty International’s Urgent Action for political prisoner Huynh Truong Ca. He is battling several ailments while in prison, including diabetes, high blood pressure, and lung disease. Earlier in March, he was transferred to a new prison, which is farther away from his family. Ca, who is co-founder of the pro-democracy, constitutional rights group Hien Phap, was arrested in September 2018 and sentenced to five years and six months in prison.